Doctors are reporting unprecedented success from a new cell and gene therapy for multiple myeloma, a blood cancer that's on the rise. Although it's early and the study is small -- 35 people -- every patient responded and all but two were in some level of remission within two months. Experts at an American Society of Clinical Oncology conference in Chicago, where the results were announced Monday, say it's a first for multiple myeloma and rare for any cancer treatment to have such success. Chemotherapy helps 10 to 30 percent of patients; immune system drugs, 35 to 40 percent at best, and some gene-targeting drugs, 70 to 80 percent, "but you don't get to 100," said Dr. Len Lichtenfeld, deputy chief medical officer of the American Cancer Society. "These are impressive results" but time will tell if they last, he said. Multiple myeloma affects plasma cells, which make antibodies to fight infection. More than 30,000 cases occur each year in the United States, and more than 115,000 worldwide. It's the second fastest growing cancer for men and the third for women, rising 2 to 3 percent per year, according to the National Cancer Institute. About 60,000 to 70,000 Americans have it now. Nine new drugs have been approved for it since 2000 but they're not cures; only about half of U.S. patients live five years after diagnosis. With cell therapy, "I can't say we may get a cure but at least we bring hope of that possibility," said Dr. Frank Fan. He is chief scientific officer of Nanjing Legend Biotech, a Chinese company that tested the treatment with doctors at Xi'an Jiaotong University. 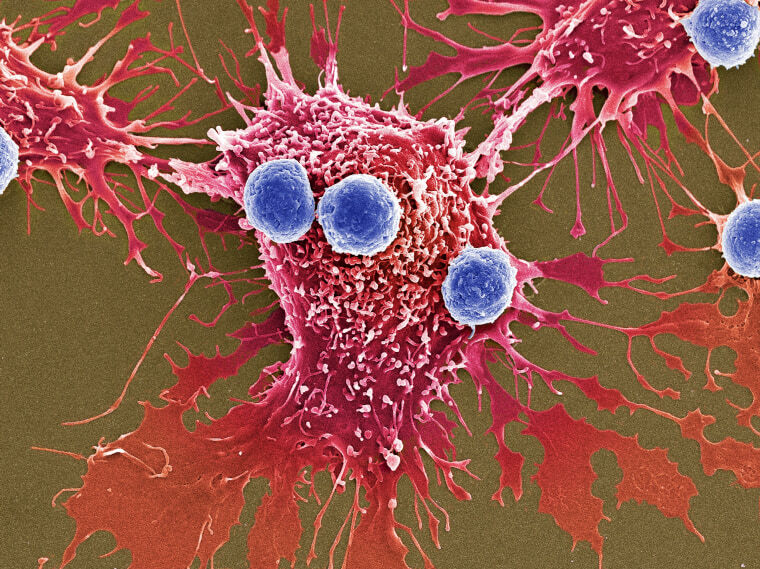 The treatment, called CAR-T therapy, involves filtering a patient's blood to remove immune system soldiers called T cells. These are altered in a lab to contain a gene that targets cancer and then given back to the patient intravenously. Doctors call it a "living drug"-- a one-time treatment to permanently alter cells that multiply in the body into an army to fight cancer. It's shown promise against some leukemias and lymphomas, but this is a new type being tried for multiple myeloma, in patients whose cancer worsened despite many other treatments. "I can't say we may get a cure but at least we bring hope of that possibility." The results are "very remarkable" not just for how many responded but how well, said Dr. Kenneth Anderson of Dana-Farber Cancer Institute in Boston. "We need to be looking for how long these cells persist" and keep the cancer under control, he said. Dr. Carl June, a University of Pennsylvania researcher who received the conference's top science award for his early work on CAR-T therapy, said "it's very rare" to see everyone respond to a treatment. His lab also had this happen -- all 22 children testing a new version of CAR-T for leukemia responded, his colleagues reported at the conference. "The first patients we treated in 2010 haven't relapsed," June said. Dr. Michael Sabel of the University of Michigan called the treatment "revolutionary." "This is really the epitome of personalized medicine," extending immune therapy to more types of patients, he said. Legend Biotech plans to continue the study in up to 100 people in China and plans a study in the U.S. early next year. The treatment is expected to cost $200,000 to $300,000, and "who's going to pay for that is a big issue," Fan said. "The manufacturing process is very expensive and you can't scale up. It's individualized. You cannot make a batch" as is done with a drug, he said. Nick Leschly, Bluebird's chief executive, said the next phase of his company's study will test what seems the ideal dose in 20 more people.